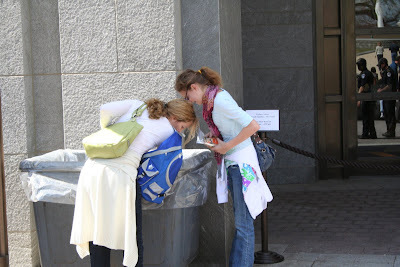 Indigents are everywhere in Washington... check out these poor souls at the waste receptacles outside the very Capital Building of our country! 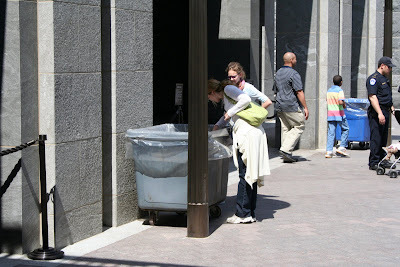 ...the older woman shamelessly digs while the young girl gathers the loot....disgraceful! Disclaimer: What you have seen and are about to read is an instance of me (Suzanne) behaving badly. I acknowledge my forthcoming decision was wrong (funny...but wrong) and have repented to my God and my family, although restitution in this case is difficult. It was a gorgeous morning as we walked up out of the metro system onto Capital Hill about 10:00am. The day couldn't have been more perfect. Being that it was our FIRST day of sightseeing, legs were still limber and spirits were high! 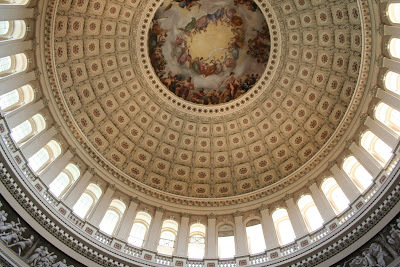 We had planned the day out perfectly, with a prearranged tour of the Capital at 11:20. I proudly carried my family's survival supplies for the day; I was armed with a purse and backpack filled with band aids, ibuprofen, hand sanitizer, tissues, sunscreen, chap stick, insurance info., gum, allergy medicine, camera equipment, a football (well, yes!) 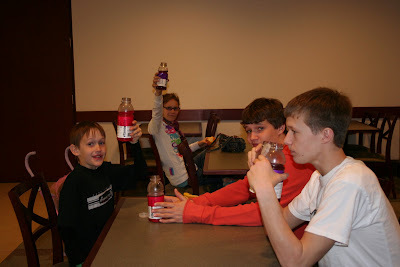 and..., of course....high energy foods and water. I figure I was packing at least $20 worth of trail mix, granola bars, Slim Jims and waters...being the first day it was the pick of my stash! We toured around the Library of Congress and the Supreme Court for an hour or so until it was time to report to the Capital Building for our tour. 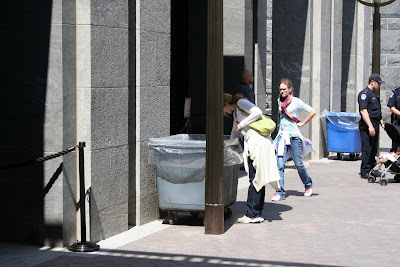 As we approached, I noticed about five guards spread out in front of the entrance next to at least three large square plastic lined garbage bins... I wasn't surprised...we'd already gone through security twice in just the last hour. This time, however, was different....and WRONG! 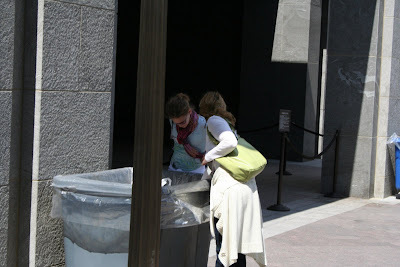 They were not letting ANY food or water into the building....NONE!..not an apple....not a water bottle...NADA. I couldn't believe it! So I placed our precious food carefully upright in the nearest corner of the bin. Then I looked that guard right in the eye, squinted and said, ..."I'll be back." ...for those doing the math, I'd just spent $35 on about $8 worth of food, and we hadn't even had lunch yet! All of this background information is to justify what comes next. Then we exited the building. "You're not really going back, are you Mom?" "Absolutely I am! I made a special trip to Target to get that food and we're going to eat it!" "We are NOT going with you!" "Fine! Follow at a distance!" And we ate them....ate them with relish! I fed contraband to my family. It was only after our bellies were full that I felt the guilt that there were probably hungry children whose mothers were even at that moment rooting around in the garbage looking for that expensive jerky...thirsty little kids...hungry families. Now not wanting to throw me to the wolves, especially after eating all the yummy loot, my kids declared that taking out of a garbage can is not stealing. But I disagree....this was an unusual situation where cash-squeezed parents were being forced to "throw away" unopened food, and surely there had to be many others like me who were going to come back and get it...therefore, it was wrong to take it, especially after my hypocritical anger at having my food taken..."Two wrongs don't make a right" and all that. So world, I am sorry. If I had to do it over again I'd make it a lesson to my kids and we would just suffer for righteousness. But it did taste really good...and in my children's opinion, beef jerky and Mesquite Kruncher Potato Chips were a real upgrade from the pumpkin flax granola and Slim Jims. (I think I agree.) So along with my apologies to the moms who made special trips to Target to get such great food which we then stole, I add my thanks for picking out such nice stuff. Would you a.) have gone back? and b.) have taken food other than what you had left? (you don't have to answer b.... if you don't want to....) c.) considered it wrong to take what was in the bin.? I love this story! What we would do and have done in the past as most building don't allow cell phones with cameras is one wait out with the bags and then the next go in. 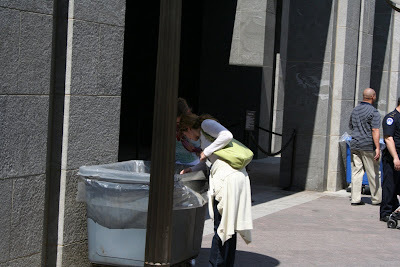 I could not reach the bottom of the garbage bin as I am too short, but maybe would have thought of it. I would definitely have gone back to get my Target Treasures! I probably would have climbed right in there and Michael with me! AND I think I would look at it as a “Pay it Forward” kind of system they have established in D.C. Your food went to another hungry family whose Target Treasures were consumed by the a previous hungry family. So, no harm done. I bet those guards get looks from a number of moms who have brought food to “save their starving children and are told to dump them only to see another mom jump into the dumpster. Boy I think I’d like to sit outside of that place and watch it all go down. Thanks for sharing Suzanne, now I know the drill. well written! that is awesome! i don't know if i would have gone back. but probably. no! most likely! you crack me up!